Our trees grow in our fields in Root Pouch pots instead of the plastic containers often found elsewhere. 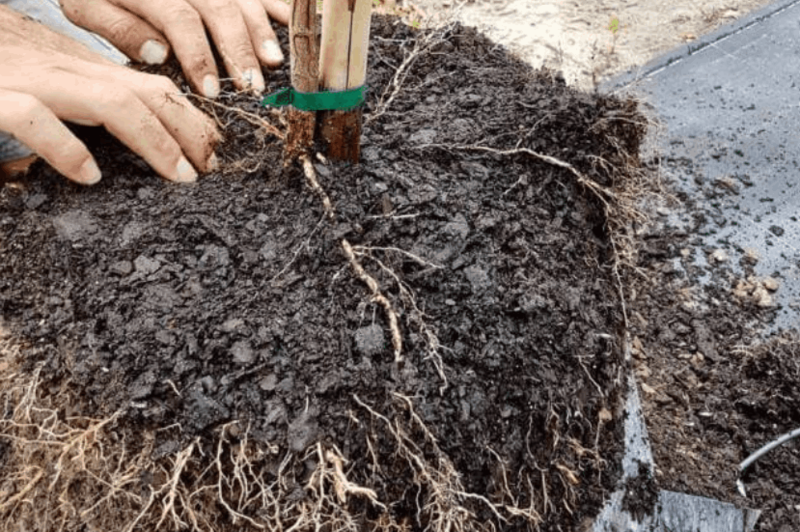 A Root Pouch allows the trees roots to grow in a more stable, fibrous structure leading to faster growth, less stress on the tree and an easier, more successful transition from the pot to your yard. The use of a Root Pouch also allows us to plant your trees at any time of the year. The Root Pouch is made of a soft sided material created from recycled materials. When tree roots reach the fabric they are air pruned which leads to a healthy, fibrous root ball. Unlike the roots you see on a plant taken from a plastic container, our trees grown in Root Pouches have roots that do not circle within the container. The resulting fibrous root ball has more root tips which produce quicker plant growth and more successful transplants.